TStv Update: What Is A' La Carte Subscription? Telcom Satellite Television simply called TStv is seriously spicing things up to give customers value for their money. Ever since the launch of Sassy Decoder, the Nigerian-owned telecom company has been adding new channels and features to the platform. The latest feature now added on TSTV is called A' La Carte Subscription and the meaning can be found here below. A’ la carte subscription gives a subscriber the opportunity to choose and pay for only their channels of interest." This simply means that customers can only pay for the channels they are interested in and save money by so doing. This flexibility is not available in most other digital TV providers in Nigeria and Africa as a whole. You will agree with me that this is a great feature and one which will once again distinguish it from the likes of GOtv and Startimes. Someone like me that is interested in news channels, discovery Channel, Sports and music channels will only subscribe for them and ignore the movie, lifestyle, religious and kids channels. Awesome I must say. Recall that TSTV is an indigenous Pay TV company owned by an Imo State young business man by name Bright Echefu. You can read his profile here. 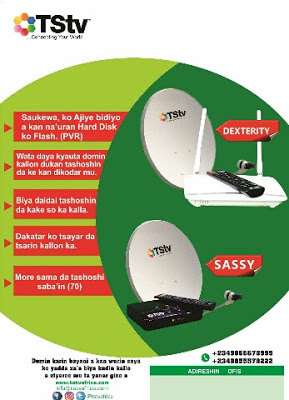 The company was launched last year in Nigeria and some other African countries but the availability of Decoders and accessories were delayed until April 2018 when it decided to make available a version of the decoder called Sassy but promised to commercially make Dexterity decoders available soon. Though no particular date was mentioned. Note that Sassy Decoder has about 70 channels and the TStv made 55 channels free for two months while the dexterity decoder will have over 250 channels including free data, wifi, pause subscription, record programs and so on. The price of Sassy Decoder is 3500 Naira while the installation cost is 2500 Naira. What do you think about the this TStv A' La Carte Subscription? Yea or Nay?